← In a Vase on Monday. Twigs. We awoke to a white garden this morning. I am not a fan of a winter wonderland. A monochrome landscape leaves me cold. Literally, even if it is a sparkly one. 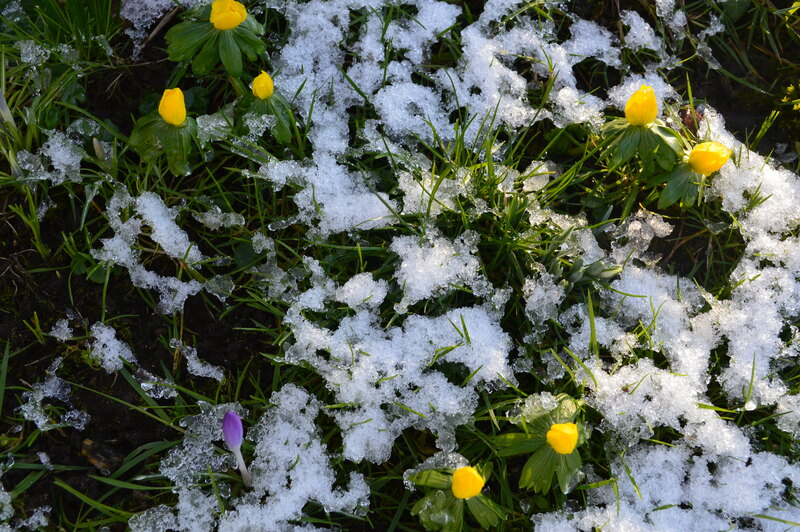 My poor hellebores and snowdrops are lying face down in the snow. I can’t get on with want I wanted to do. The visit of a very special garden friend had to be cancelled. So I am not feeling very gruntled. 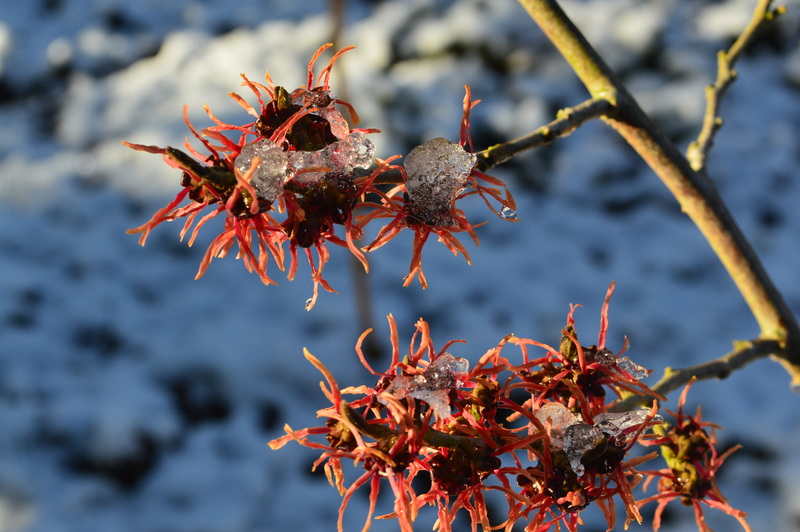 But the spidery flowers of Witch hazels are quite unfazed by the ice crystals decorating their branches. Buttons of Winter aconites look pretty against a gleaming white background. 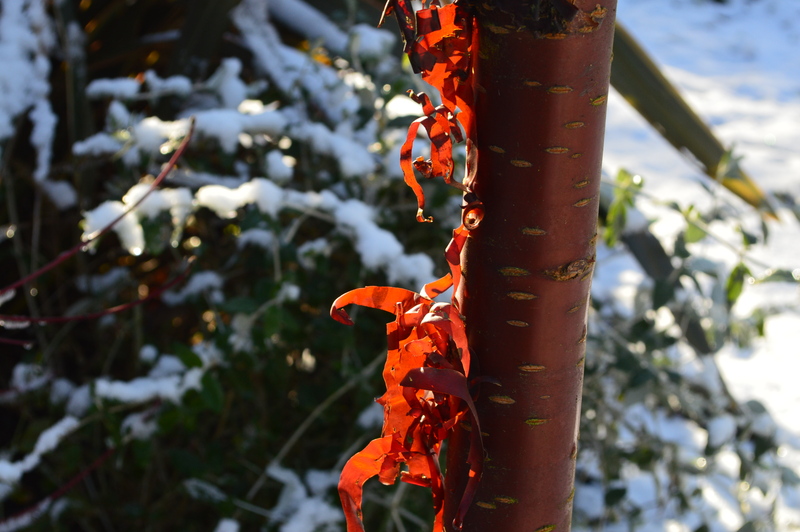 And the cinnamon strips of flaking bark on Prunus serrula shine in the sun. In the churchyard the sun has melted the snow and swathes of Galanthus nivalis are dancing round the ancient gravestones. This form is not a bit like the form in my garden which has smaller flowers and is still in bud. 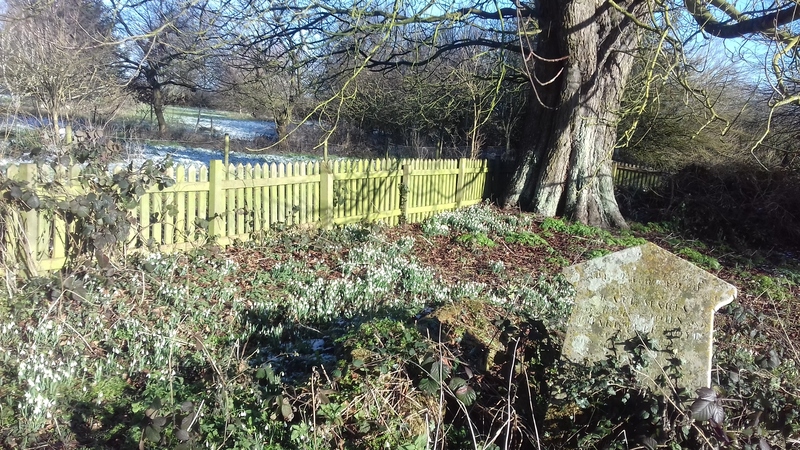 Some of the best displays of snowdrops can be found in ancient graveyards like this. But really after a brisk walk the only place for a disgruntled gardener is the greenhouse. Because despite an icy scene outside, spring has arrived in there. My greenhouse is really delighting me at the moment. So a greenhouse post will be coming up very soon. 32 Responses to Iced Landscape. That is pretty sweet. I hear so many express a dislike for the snow, and after experiencing a slight bit of it in Oklahoma, I sort of get it. However, because it does not snow here, I often wonder what it would be like. I know it would damage the redwoods, but I try to imagine that it would be pretty. So would icicles on the springs. It is pretty for a while but if you are a plant lover, icicles quickly lose their appeal. Absolutely fabulous photo of your Prunus! Thank you Jen, the sun was just in the right place. Thank you Mike. Yes, it was nice and sunny for a brisk walk but frustrating if you had garden plans. I hate when that happens, especially as you have so many plants in bloom. Enjoy your greenhouse. Thank you, yes there is plenty to enjoy in the greenhouse so that is some compensation for a snowy garden. Yesterday we had a hoar frost which looks beautiful but you don’t feel like lingering long out there looking at it. None of the promised snow here (yet) but it is VERY scrunchy underfoot because it it is bitterly cold and the frost has hung around for several days. My snowdrops and witch hazels look just like yours, trying to grin and bear it. No greenhouse jobs for me and I had to resort to decorating instead although I have also sorted out some pictures for my garden club talk in a few weeks time. Such a shame about the cancellation of the visit of your very special garden friend… Looking forward to that greenhouse post! Yes, I’ve just been looking at your wintery end if month view of the garden. Not somewhere to linger at the moment. I’m interested to hear about your garden talk, well done you! I hope my garden friend’s visit will be rescheduled. What a contrast to what we’ve been experiencing! It looks quite delightful to me, but I expect the novelty would soon evaporate with the onset of cold fingers and toes. Some people love snow, but I’m not one of them. I suppose it is quite pretty but you can get tired of it very quickly. Snow is so very pretty, at least in photos. I’ve literally never had to deal with its impact but I can imagination that any thrill in its appearance would be fleeting. I hope you get a nice melt soon. Thank you Kris. Fortunately snow never lasts long here and when I read about the polar vortex in the States I really feel I have no right to complain. That Prunus bark is stunning! I’ll look forward to your greenhouse post. 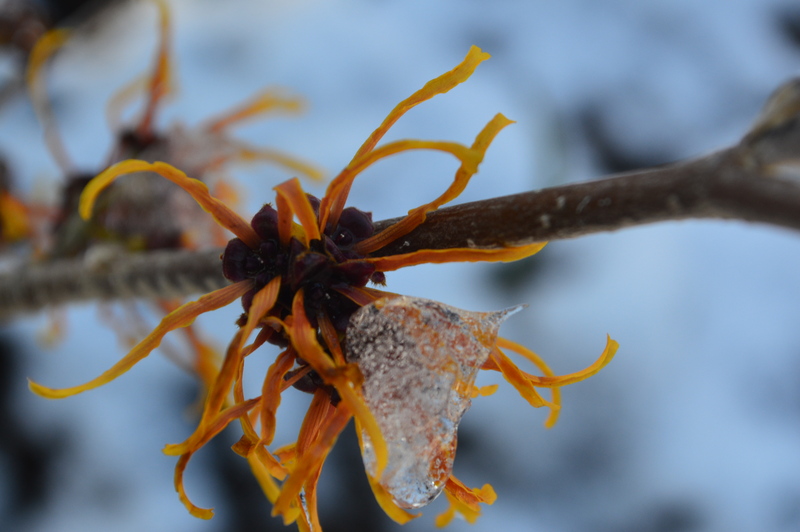 And oh my goodness…the Witch Hazels are in their glory in your garden! Really special! Prunus serrula is fabulous, I love the way it peels off in long tattery bits. 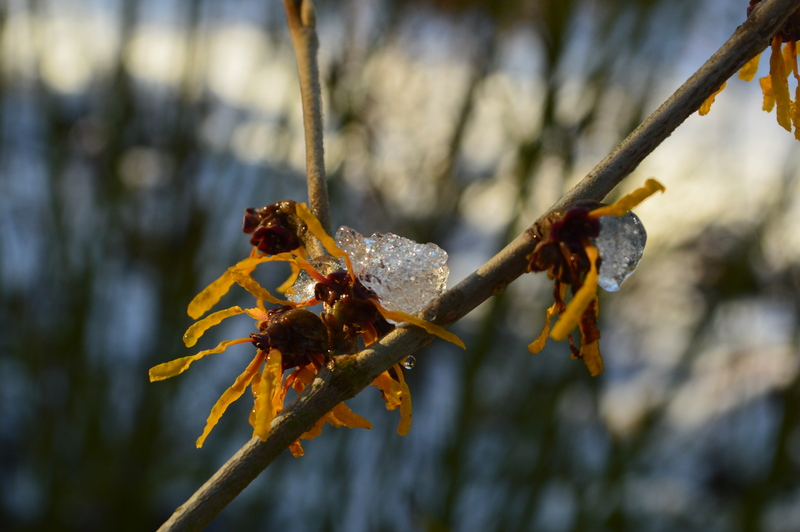 The Witch hazels amaze me as they seem quite unaffected by the ice and snow. Laughing with you. I am not feeling very gruntled as well. It has been raining for what seems like weeks here, spawning fungus and a cold wind is blowing in from the north. Baking Foccacia today instead of gardening. The Witch Hazel cheered me up, thanks. I can’t inagine it cold and wet in Florida. I thought it was the land of eternal sunshine. I wish I could pop over and have a chat and share your foccacia. Or you could pop over here, I’ve made some rather good butternut squash soup we could share. Sounds like a plan for lunch in the garden!! My English garden inspired Leonitis and Petunia exserta are flowering now. Love the Petunias, still waiting for Hummingbirds and Butterflies. Sowed some Bachelor’s Buttons and have more heirloom Zinnias and Celosias to try. Believe it or not, there is a lovely heirloom Celosia. I think it will grow here through the summer. Brrrrrrrrr! What a shame that you had to cancel your friend’s visit Chloris but I hope that you found some warmth and comfort in your greenhouse . We woke up yesterday morning to about an inch or so of snow on the ground. That carpet of snowdrops in the graveyard is beautiful. In fact it is a mutual friend Anna! I’m sure you can guess who. But the weather forecast was so awful that plans had to be cancelled. I suppose your snowdrops are safe in your greenhouse where you can enjoy them in comfort. We are under a solid blanket of snow and ice almost 2 feet thick. It looks like you are also getting a taste of polar vortex mischief. Oh my goodness, how awful. Yes, I have read about your polar vortex and it makes me feel very guilty about complaining over less than an inch of snow like a petulant child. I think gardeners should have a special dispensation when it comes to atrocious weather. A farmer once said to me that snow always looks wonderful on someone else’s land. I have to agree. I agree with that farmer. I don’t mind if it falls next door and I can admire it from the window. Snow is pretty for about the first 3 hours then I can easily manage without it! Your images do capture the magic of the light in the winter garden which is such an important element, I think. What a shame that your gardening friend was unable to come, I do hope you’ll be able to reschedule it. I agree about the snow. Yesterday we had a hoar frost and the grasses and seedheads looked magical, but pretty as it is you tire of it very quickly and want the garden back. My gardening friend is a mutual friend, you have met her. As she lives a long way away, the trip wasn’t really feasible with this awful weather. Well you spent your cold weather time wisely with all that painting. Today has been really springlike, I hope you have been enjoying it too.